The Philips DigiTrak XT Holter Recorder is specifically designed to make life easier for healthcare professionals and patients. 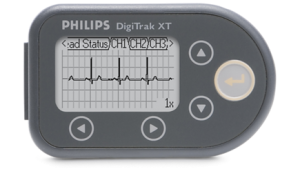 Combined with powerful Scanning Software, the DigiTrak XT makes it easy for staff to check the quality of the patient hook-up on all 3 channels, and turn on features such as Pacemaker Detection. An excellent Holter system is made up of two components: a feature rich Holter recorder or Holter monitor combined with Holter scanning software that can quickly and correctly identify heartbeats with tools that make scanning easier for the technician. The Philips Holter Monitor System with Zymed algorithm has perfected these components to deliver a solution that will deliver results to medical professionals faster, more accurately and more securely. You can automate the Orders In to the Philips Holter System and push Holter Reports to your ECG Management solution or EHR/EMR so physicians can quickly read, edit, electronically sign and confirm reports. Upon confirmation Holter Reports can be either linked or embedded in the patient’s chart in your EMR/EHR. Automate Results Orders in and results out all done electronically. Fast downloads within 90 seconds. Customized reports. Eliminates typing errors. Improve Workflow Enhance your productivity with workflow advantages created by interfacing your Philips Holter solution with your practice EMR, His or ECG management system. The easier it is for your staff to use and understand the technology and tools they’re utilizing, the more productive they can be while using the Philips Holter System. The DigiTrak XT Recorder has an easy-to-use interface. • Patient demographic pre-configuration and preview feature streamlines your workflow and boosts clinical productivity in the Holter lab. • Pacemaker Sensitivity – Adjust the sensitivity to show pacemaker spikes without counting them as heartbeats. Windows Compatible Compatible with Windows 7 and Windows Enterprise, and Windows Server 2008 Standard Edition operating systems and works on 32-bit and 64-bit computers. Electronic Signature Electronically read, edit and sign Holter reports within Philips Holter or through your EMR, HIS or ECG management solution. Light Weight The DigiTrak XT Recorder is extremely comfortable for patients. Weighing in at 2.2 oz (62.4 g), the DigiTrak XT is one of the lightest recorders on the market. The sleek, streamlined design, light weight and swivel belt clip ensure patient comfort and privacy, The DigiTrak XT also includes a reusable pouch and lanyard for comfort. Innovative and Smart DigiTrak XT is built and designed to improve efficiency, comfort ability and accessibility. Between the large onboard display, its ability to reduce artifacts and its water-resistance, the DigiTrak XT Recorder works to deliver accurate information you need when you need it. • Improve Efficiency – Requires only five electrodes, EASI lead placement on clear anatomical landmarks reduces artifacts and imrproves signal-to-noise ratio while providing quick and easy hookup. • Water Resistant – The recorder can withstand an accidental dip in water without requiring it to be sent in for service. • Enhance Data Security – non-removable memory prevents accidental loss of valuable patient data. Downloads data in under 90 seconds. • Innovative Design – Onscreen status indicators, automatic DST adjustment, personalized default settings and secure cable connection. Extended Recording Time The DigiTrak XT is available in four versions. You can purchase 24-hour, 48-hour, 96-hour or 7-day capabilities. A DigiTrak XT can record for any length of time desired up to the maximum limit. For example, you can use a 48 hour DigiTrak XT monitor for a 24 hour test. • All versions delivers full disclosure ECG data with pacemaker detection on all 3 channels using a single AAA battery. • No Data Compression – Get up to 7 days of high-quality ECG information without data compression. For more information about the DigiTrak XT Recorder and discover which Holter solution is right for your needs, please contact us.